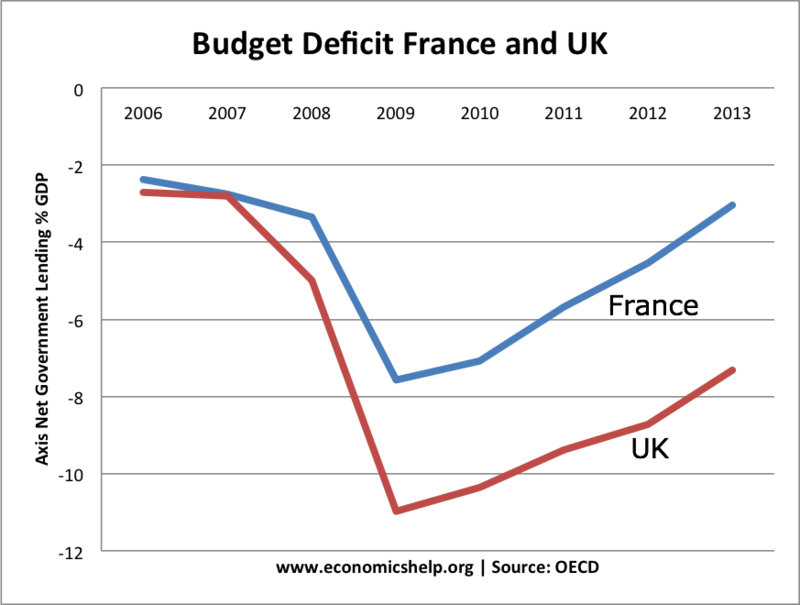 Home > Economics help blog > economics > Is the French Economy at Risk? Is the French Economy at Risk? The French are not too happy. The rating agency Moody have stripped France of their triple AAA rating – downgrading French debt to AA. [link] It probably wouldn’t be so bad, but their English neighbours still retain a AAA rating, despite having a much higher budget deficit. As the English would say, that’s just not cricket. To rub salt into the wounds, the Economist recently ran a cover with several baguettes wrapped around with a lit fuse ready to explode – The French economy on slow road to Crisis at Economist.com. Is the French economy really at risk? or is the Economist just indulging in the traditional game of baiting the French? So far, the French have been able to weather the Euro crisis. Markets have been reassured that the French economy is strong enough to deal with the twin problems of debt levels and sluggish growth. 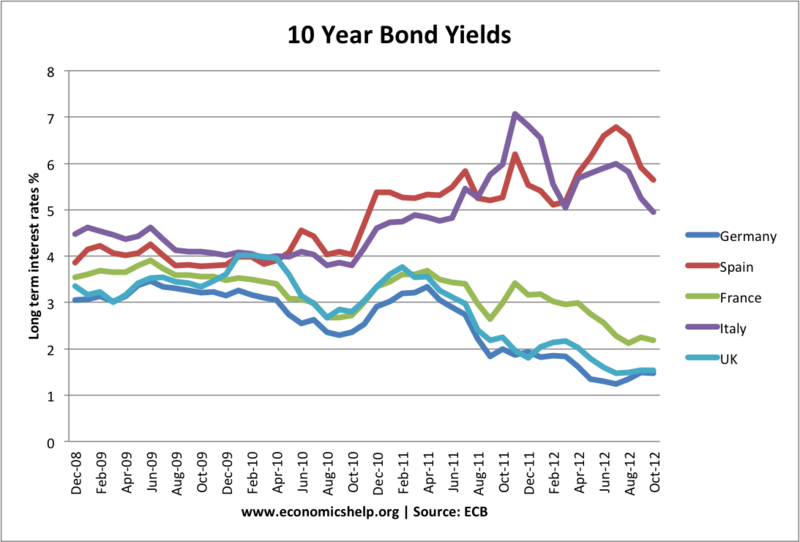 Furthermore, if you take the optimistic point of view, there are some signs that Eurozone bond yields have fallen from their previous peaks. The Spanish premier has recently claimed the worst of the Euro crisis is now over. However, as the crisis drags on, the debt to GDP ratio show little sign of immediate improvement, The Eurozone economy is getting dragged into a recession, and the French look more vulnerable at their exposure to other countries debt, and the growing possibility of years of economic stagnation. Optimism is a good thing, but in the context of the Eurzone, optimistic forecasts for recovery have shown a depressingly regular habit of proving to be wrong. You are hardly reassured when the Spanish Premier claims the worst of the crisis is over. For France, low bond yields are good and they have enabled them to borrow at low rates, but should the economy deteriorate, the markets could quickly turn. Contrary to market fears, the French government have shown some signs of reacting to the long-term decline in French competitiveness. The government is trying to push through legislation to improve labour market flexibility – making it easier to hire people. The government is planning an ambitious tax cuts of €20bn in annual tax credits to companies hiring labour – hoping to reduce labour costs. However, the French government has a poor track record of actually pushing through labour market reform. It is one of the most regulated labour markets in Europe. With powerful trade union opposition and opposition from within Hollande’s own Socialist party, there isn’t the political will to push through unpopular labour market reforms. Also, the €20b in tax credits for business have to be placed in comparison with recent austerity measures, which included a higher rate of income tax of 75% and promises to tax the wealthy. The plans to reduce the deficit, are likely to be contractionary – just as they have been every where else in Europe. French public spending is over 57% of GDP, one of the highest in Europe. High levels of public spending are not necessarily a guarantee of insolvency – Scandinavian countries have similar rates of government spending. 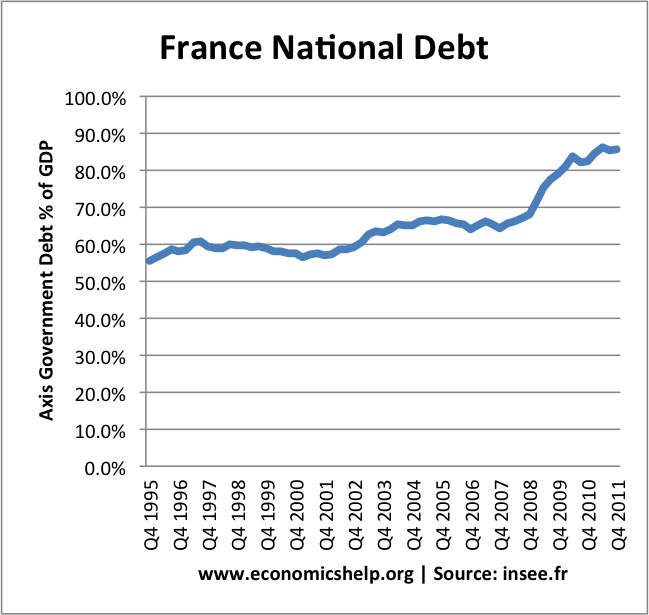 But, the increase in public sector debt from 21% of GDP in 1981 to 90% in 2012 does hint at the powerful vested interests in supporting public spending within France. Reducing this debt in the face of a depressed economy will be very difficult. Difficulties in reducing this public spending was highlighted by the government’s decision to cut the retirement age for public sector workers from 62 to 60. At a time when most economies are considering raising the retirement age in response to an ageing population, France bucked the trend, adding more pressure on government spending. It is true, France doesn’t have the worst demographics; it’s population is forecast to age at a slower rate than many other European economies, but it also has a growing problem of long-term unemployment, especially amongst the youth. Recent years have shown that countries who lose competitiveness within the Eurozone can be severely punished. In the past few years, unit labour costs in France have increased faster than Germany. A modest French current account surplus has been replaced with a growing current account deficit. France is still one of the world’s largest exporters (sixth largest exporter). It is also the fourth biggest recipient of foreign direct investment in the world. It has many strong points, such as infrastructure, education, transport and expertise in high tech industries. But, in a fast moving world, will France be able to maintain a competitive edge, in the fixed exchange rate? To some extent, the nature of the Euro and Eurocrisis, means that the future of the French economy may well be heavily influenced by events elsewhere in Europe. If Europe continues to be dragged down into a period of stagnant economic growth, the debt crisis, temporarily abated, may become re-ignited and get worse than ever before. If Italy or Spain get into serious difficulties, it won’t take long for markets to start casting suspicious eyes over French debt and the French economy. France also faces the over-riding European problem – there is little strategy or policy to promote economic growth and lower unemployment. Should French bond yields start to increase, expect more panic inducing austerity measures, which fail to solve the problem, just as has happened elsewhere. The problem France may face is that the political will to make necessary economic changes may not be there until it is too late. But, even if France were to improve labour market productivity and efficiency, it may still not be enough to deal with the long-term malaise of the European economy. This entry was posted in economics and tagged euro crisis, french economy. Bookmark the permalink.